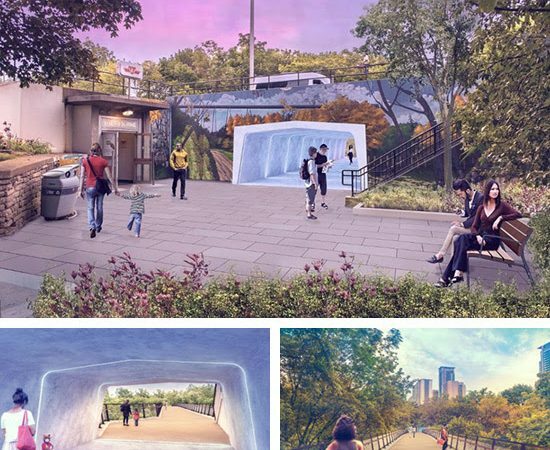 The City of Toronto invites professional artists (including artist teams) to submit their Expression of Interest to the first stage of a competition for integrated public artwork(s) as part of the redesign and replacement of the Glen Road pedestrian bridge and tunnel. The art component of this revitalised public space will be selected through an open two-stage competition, with a net budget of approximately $285,000.00 (+HST). The project budget includes all costs directly associated with the artwork: all fees for design, fabrication, installation, engineering and professional services, insurance, travel and other incidental expenses. The Glen Road Pedestrian Bridge, built in 1972, is a steel and timber bridge that extends from Bloor Street East in the south to Glen Road in the north, passing over the Rosedale Valley. At the south end of the bridge, under Bloor Street East, is a pedestrian tunnel which provides a connection to Glen Road in the south and the TTC’s Sherbourne Station. In 2003, the bridge was designated under Part V of the Ontario Heritage Act within the South Rosedale Heritage Conservation District and added to the City’s heritage register. As a result, the new structure is expected to retain the design attributes of the existing bridge, and maintain the views to and from Rosedale Valley. The pedestrian bridge and tunnel will be widened and redesigned to address concerns about personal safety and to increase natural surveillance on the bridge and in the tunnel area. The design is currently underway, led by the City’s consultant, Morrison Hershfield, and anticipated to be completed by late summer 2019 and tendered by the end of the year. Construction is planned for 2020-21. Public art funding is provided by the City’s City Planning-Urban Design and Transportation Services divisions. The experience for users of this renewed public space will include a project by a professional visual artist or an artist-led team, selected through an open competition, with a net budget of approximately $285,000.00 (+HST). The project budget includes all costs directly associated with the artwork: all fees for design, fabrication, mechanical, electrical, structural and engineering drawings, and installation, as well as contract administration, travel and other incidental expenses. Thematically, artists are asked to broadly consider the history and ecology of the area, some of which is detailed in the EA. The Rosedale Valley ravine is the site of a buried stream where Rosedale Valley Road now runs, and is part of the Don River Watershed. It is an Environmentally Significant Area (a space within Toronto’s natural heritage system that requires special protection to preserve its environmentally significant qualities), and is covered by the Ravine and Natural Feature Protection By-law. The tunnel and retaining walls to the north and south are the primary sites, although artists are asked to consider the site as a whole, including the bridge landings to the north and south, and the small plaza on the south side of the tunnel at Glen Road. The overall vision should create a connection between the Rosedale Valley, the south plaza and the subway entrance and the two local communities on either side of the ravine. The bridge and tunnel are in use at all hours, and proposals should take into account day and night use and visibility. It is anticipated that proposals could include both two- and three-dimensional components, and a combination of materials, such as paint, tile, concrete formwork (especially in the underpass), lighting elements, and small sculptural objects. Due to the many safety and maintenance requirements of bridges, underpasses and right-of-way sites, artists must be prepared to meet and work collaboratively with City staff and contractors to develop and refine proposals according to these parameters, which will be further specified in the Terms of Reference for short-listed artists. This is a two-stage, open, international competition for professional artists. A specially convened Selection Panel, composed of practicing arts professionals and community members, will be established for this two-stage competition. The Selection Panel will review all submissions and identify a short-list of five (5) artists, based on artistic excellence and demonstrated or perceived ability to create and execute an innovative, engaging public artwork that is complimentary to the overall design scheme and context. The short-listed artists will be notified in mid-April and invited to submit a conceptual design proposal. A detailed proposal is not required, but artists should show visual concepts and thematic ideas. A detailed Terms of Reference project document will be provided to help short-listed artists prepare their proposals. Short-listed artists will be paid a fee of $2,000.00 (+HST) for this stage. Short-listed artists will attend an interview and present their proposals to the Selection Panel the third week of June. The panel will choose a finalist whose vision for the site best suits the overall scope of this project, and has the ability or perceived ability to conceive and realize a public artwork on this site. The selected artist will be notified in late June, 2019 and all final design drawings required for the construction tender must be submitted by early October, 2019. Late June – early October: Design development of selected project, submission of final drawings to construction tender (as required). Brief artist statement outlining interest in project, showing relevant experience, ability, and general artistic approach. Do not include proposals at this stage. Maximum ten (10) images of work, with caption including title, materials, dimensions, location, and commissioning body (if applicable). Audio / Video files may be provided via URL. Names and contact information for two references (preferably from recent projects). Submissions must be received by 4pm, Monday, April 1, 2019. We thank all respondents for their submissions but only applicants advancing to the second stage of the selection process will be contacted.